At first glance, a cheerful mural and one pleasant to look at, but it has hidden depths when we pay closer attention to detail. This is artist 2501’s last such colourful wall. Shortly after completing the mural in Zaspa, the artist changed his style altogether, working from then on exclusively in monochrome lines. Italian artist, painter, illustrator and animator. Well presented in the Zaspa Collection. 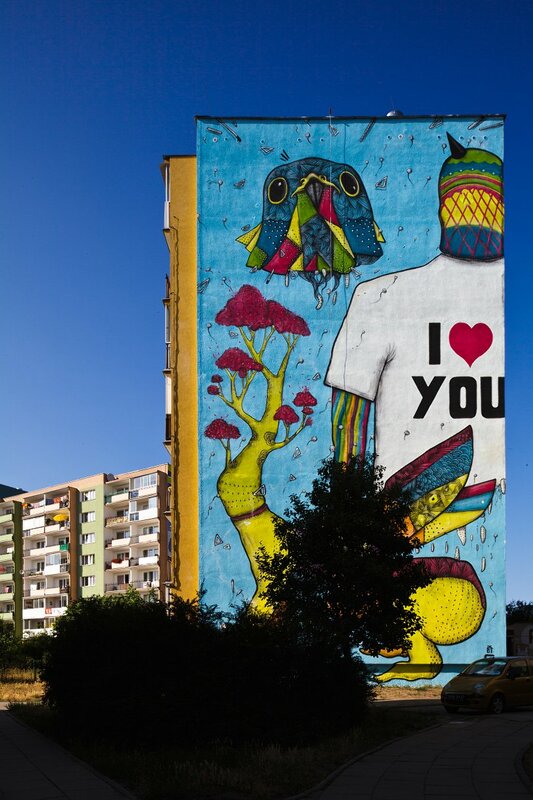 Besides, the I Love You" mural, he painted a mural together with Piotr Szwabe, a piece painted tro commemorate the Chopin Year, as well as Prozak's piece created during Art 2011.